The Oregon Republican Party has called on Portland mayor Charlie Hales to resign citing dereliction of duty for the out-of-control riots following election day. They’ve also asked the Democratic Party of Oregon to join them in renouncing the mayor. 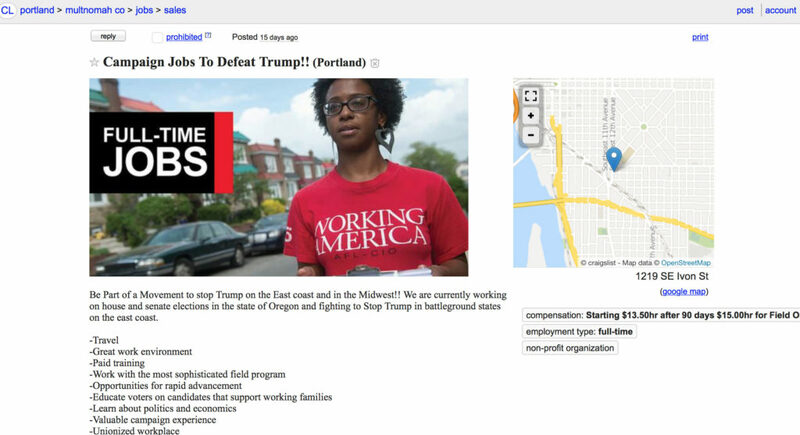 As I pointed out here, there’s evidence that the so called “Stop Trump” protesters have been paid by unions and other organization working with them. And it’s refreshing to see somebody demanding civility and order in Portland. More proof that the crowds around the nation “protesting” Donald Trump are just an extension of the usual paid political protesters from the ‘Peaceful Response’/ANSWER crowd to ‘Jobs for Justice’ to Occupy Wall Street to ‘5 for 15’ to Black Lives Matter. Now this. Within in the last couple of weeks, James O’Keefe and his Project Veritas undercover video showed Democratic operatives paid protesters to pick fights and escalate violence at Trump rallies. The same operative admitted to arranging to illegally vote by busing people in–or buying them cars. "Be Part of a Movement to stop Trump on the East coast and in the Midwest!! We are currently working on house and senate elections in the state of Oregon and fighting to Stop Trump in battleground states on the east coast. With over 3 million members, Working America knows what it means to build strength in numbers." $15 - $18 hourly rate + bonus + overtime! up to 77 hours per week! Since Portland, Seattle, Philly, Chicago and other cities where riots have taken place pay the protesters it seems it would be pretty easy to track down whose liable for all the damage.